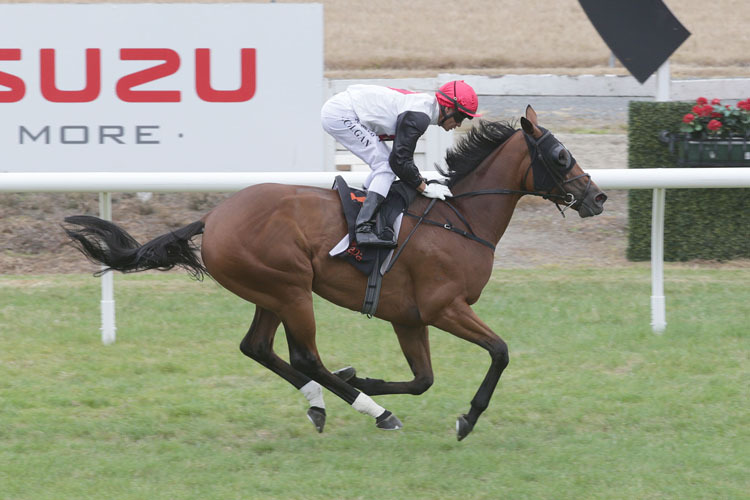 Exciting staying prospect Rondinella gave racing fans at Te Rapa on Saturday another glimpse of her undoubted talent when she treated her rating 82 rivals with distain when scoring handsomely over 2100m. The Ocean Park four-year-old mare was all class as she looped the field for rider Vinnie Colgan with 3 f to run, before cruising clear in the home straight to win untouched by six lengths. Touted by co-trainer Roger James as a potential top-liner early in her three-year-old season, Rondinella had that campaign cruelly ended when suffering a hoof injury soon after finishing fourth in the Gr.2 Sir Tristram Fillies Classic (2000m) a year ago. Patiently handled, the daughter of Group One performer Valpolicella signalled her return to the track with a fresh-up win over 7 f last November. Four starts since then have yielded two further victories as James and co-trainer Robert Wellwood continue to get her career back on track. “I expected her to be very hard to beat,” James said. James was at his cryptic best when signalling the way forward for his charge. “When you’re coming through the grades, it’s a little bit one race at a time,” he said. James isn’t dwelling on what could have been but for the injury the mare suffered, although he did admit it was a dreadful feeling when he discovered the situation. “I’m one to look forward not back but I was nearly in tears when I discovered her injury in the autumn,” he said. “You get over these things and it has been handled well by everybody and she is problem free now. Rider Vinnie Colgan, who was substituting for the ill Michael Coleman, was quick to reiterate the comments made by James about the mare’s ability. “The race went to plan as I got off (the rail) as soon as I could and the rest of the race just went perfect,” he said. “She’s very talented and Roger has always had a big opinion of her. Bred in partnership by Haunui Bloodstock, Garry Cranny and Cathy Franich’s Frantic Bloodstock, Rondinella is raced by Haunui Farm and Franich. The win was part of a special treble on the day for Haunui Farm who also saw horses that had been sold by them at the National Yearling Sales in the past three years pick-up victories in the Gr.2 Cambridge Stud Sir Tristram Fillies Classic (2000m) with Imelda Mary and the Gr.1 BCD Group Sprint (1200m) with Melody Belle.